It's hard to know what it is about Kim Stanley Robinson's novels. They're page-turners in the sense that once I'm already reading one I feel compelled to continue reading, but somehow once I put the book down I do not look forward to picking it up again. His characters and situations are memorable, but I can't escape the feeling that I read him because he's somehow good for me. This, combined with the fact that his books tend to be rather long, means he takes a while to read. I've accumulated something of a Robinson backlog on my shelf, and I pledge to work my way through it by keeping one Robinson book going at all times while I'm also reading something else. Have I just warned everybody not to read him? I hope not. His books are worthwhile... they're just long-term projects. The Gold Coast is not about Australia, it's about Orange County, California in what seems to be approximately the 2030s. Jim is a marginally employed writer in his twenties who spends much of his time hanging out with friends getting high. The other chief protagonist is his father Dennis, a cog in the military-industrial complex desperately trying to find meaning in his work as he deals with the frustrations of bureaucracy and corruption within the Defense Department. Jim falls in with a group of quasi-anarchic peaceniks who sabotage local defense contractors, fully recognizing the obvious moral dilemmas this will most surely cause for him. Meanwhile, as a local history buff, Jim writes of the history and the transformation of Orange County, and the loss of the orange groves which once gave it its name. 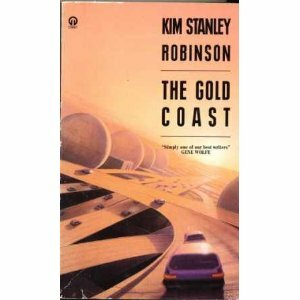 The Gold Coast, published in 1988, takes place in a 21st Century in which the Soviet Union never fell. I can accept this; there are plenty of USSR-laden 21st Centuries in science fiction. The USA and the USSR have put off the Cold War's apocalyptic nuclear finale, which some people are convinced is inevitable but which Dennis convinces himself his work is helping to make impossible. Instead, the superpowers are fighting proxy wars on several continents simultaneously. As hypothetical futures which are no longer within the realm of potentiality go, this is a believable one. What strained my credulity was the fact that nobody in this 21st Century owns a cell phone. You'll never know this from the novel itself, but The Gold Coast is the middle entry in a trilogy called 'Three Californias'. Apparently the first book, The Wild Shore, is about a post-nuclear war California; the last book, Pacific Edge, is a positive look at an ecologically sane future. I have yet to read these futures. The middle child of a book that I just finished reading got a hyper-capitalistic ultra-developed California as its setting, and you know, despite the whole USSR-still-existing thing, somehow I suspect this future is still the most likely to come true of the three. I have never been to Orange County. In fact, if you don't count changing planes, I have never been to California. All I know of Southern California geography is what I've managed to piece together from movies and TV. And that's OK. Readers of SF know how to immerse themselves in an unfamiliar fictional environment, and the Orange County of the 2030s is no different.